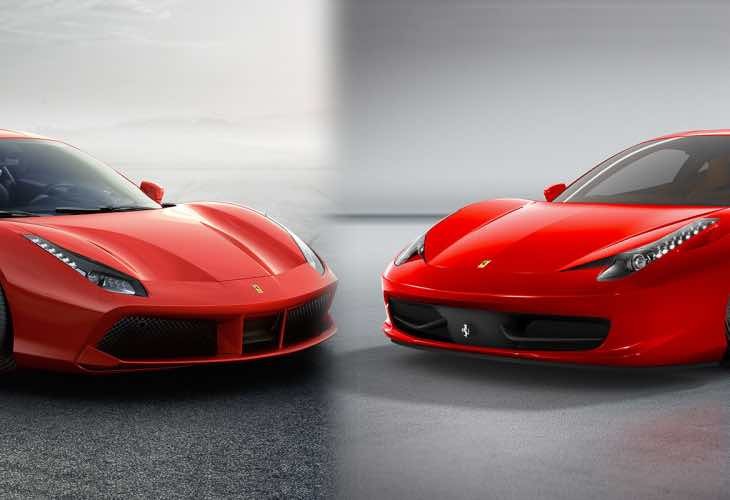 Ferrari 488 GTB vs. 458 Italia engine specs – The former makes use of a powerful 3.9-liter twin-turbo V8, which is enough to produce 660 horsepower and 560 lb-ft of torque. Compare this to the latter with its 4.5-liter naturally aspirated V8 engine that pumps out 562 horsepower and 398 lb-ft of torque. It’s clear to see that Ferrari will not doubt move into using turbochargers more, especially with differences like those above. If you don’t believe this, then check out the performance comparison, which is 0-62 mph in 3 seconds for the 488 GTB compared to 3.4 seconds for the 458 Italia. We are not sure of its top speed, but it is rumored to be 205 mph, which is slightly faster than the 458 Italia. We do know how much you will have to pay for the Ferrari 488 GTB, and that is around NZ$500,000 . Can you tell the differance?